July 6, 2000. 5 of us loaded into a rented van at 10:30 pm and drove all night long to Chicago. This is a trip that the 5 of us will never forget. Our objective was to have the darshan of Leela's extended guru family and to have darshan of Steve's guru, Anandi Ma. We stayed with Mahen and Usha Panchal and everyone got to experience what it is like to live as a member of an Indian Family. And what a family! 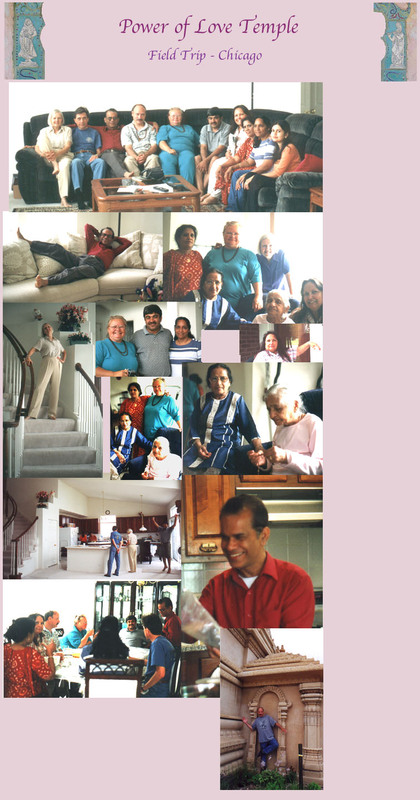 Kiritbhai and Asha Shah, also devotees of Kripalu lived in Naperville and also treated all of us like family. Royalty would not have gotten better treatment than we did. Mahen drove us to the art museum giving curb side service - picking us up so we didn't have to deal with Chicago traffic. He took us to the Indian shopping area and to Anandi ma's lectures and to any place else we wanted to go. Kiritbhai invited us to his home on Friday evening after Anandi Ma's lecture... where we met a group and sang bhajans in Gujarati and English. On Saturday, we visited the Hindu Temple of Greater Chicago where we met our friend Vanamurthy Sundara, foreman of the sculpture team there. He invited us to his home that evening. We explained about Anandi ma's lecture. "No problem... 10- 11 12 midnight - just come." We invited Anandi Ma and Dileepji to come to Power of Love Temple. They said YES. 9:30 pm all 7 of us arrived at Vananmurthy's. He showed us a video of his brother that was on PBS, his wife made us a South Indian meal, and he gave each of us gifts of sculptures of Ganesh and Krishna. Sunday Morning - 7 of us arrive for Indian Brunch at Kiritbhai's. Mahen gives a gift of earth from Kayavarohan, and Ganges and Narmada River water. Mahen literally gives Leo the shirt off his back. Steve Kelley poses as the unknown, yet to be acknowledged God outside the Hindu Temple of Greater Chicago.